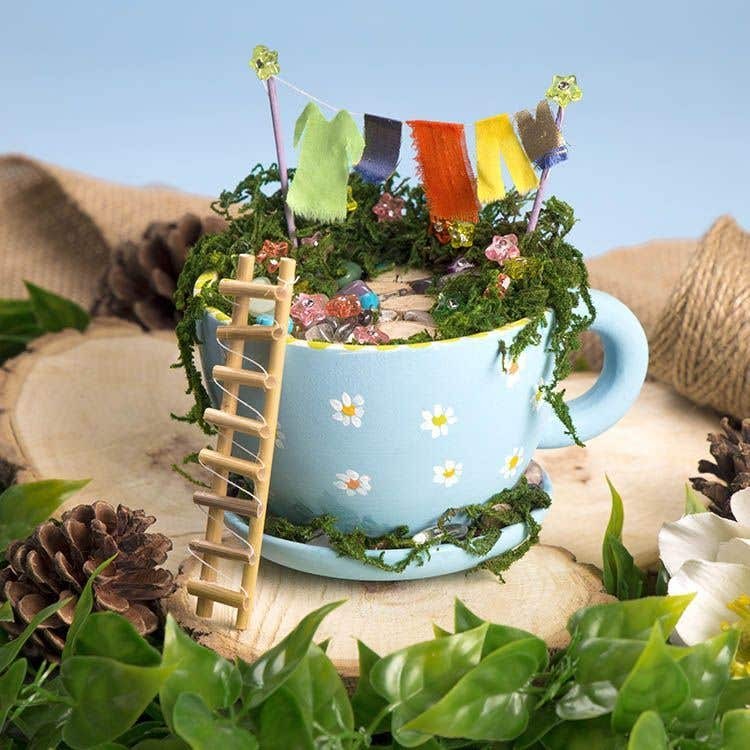 Create a miniature garden inside teacup with stones, beads and other small- scale materials. Dont forget the ladder for the fairies to climb up! Paint a teacup and saucer with a base colour using acrylic paints. Mix small amount of a colour with white to make a pastel shade. Leave the paint to fully dry then paint a pattern using a small brush or a cotton bud. Roll a piece of air-drying clay into a ball about the size of a small orange then push it inside the cup. Press the clay with your fingers to make a flat base for the garden. The clay needs to fill the cup to about 1cm from the top, so add more clay if you need to. Leave the clay to dry overnight. 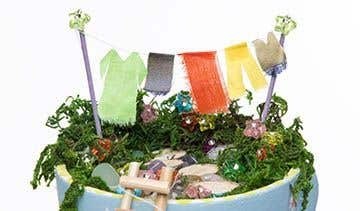 Select some small stones, branch chips and beads for garden, spread glue over the dried clay then press them in place. Add more glue around the edges and fill any gaps with dried moss. Push 2 small wooden sticks into the clay for holding the washing line, you could use pieces cut from thin wooden kebab skewers or real twigs. The clay takes several days to fully harden, so the sticks should push into the surface. Tie a piece of thin thread onto the top of each stick with a small amount of glue to hold the ends in place. Glue tiny cut out clothes along the line and beads on the top of the sticks. For the fairy ladder, cut 2 x 10cm lengths from natural straws for the sides. Glue 8 x 2cm pieces across the middle for the steps. Leave the glue to dry then weave thread through the straws as a decorative detail. 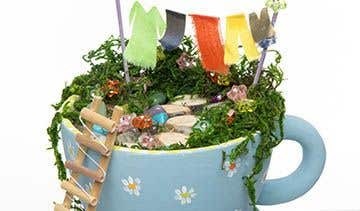 If youd like to use real plants, paint the inside and outside of cup and saucer with waterproof Porcelain Paints, instead of acrylics. 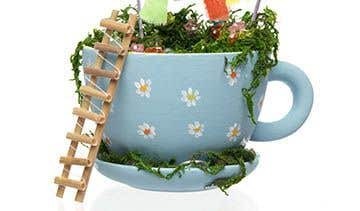 Once the paint has been baked and fixed, fill the cup with damp compost with some miniature plants.